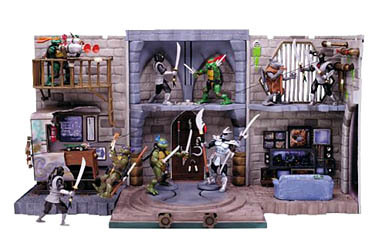 The Deluxe Turtles Lair Playset models from the Teenage Mutant Ninja TV Show. The Playset features lots of spring loaded weapons, trap doors and hand operated features. Folds up into a storage compartment and is portable and easy to carry. Will be packaged in a decorated closed box.